Just looking over the WCC-only stats... how freaking awesome has TJ been? 12 points a game, shooting 46% overall, 55% (!) from three, 4 assists a game, 85% from the line, 1.6 steals, and 1.4 assist/TO ratio. And leads our team in minutes played. Seriously, what a difference maker he's been. The first time I saw this kid's film, I was blow away by his skill level. He's one of the best players UP has seen in the last 20 years. He's up there, IMO, with Jeter, Chatman, Houle, etc. 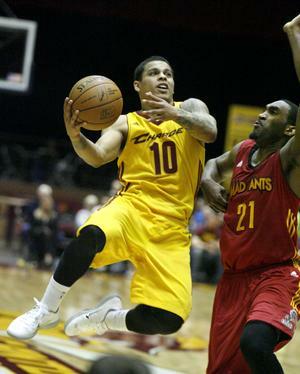 Canton Charge point guard T.J. Campbell will join 2011-12 NBA Rookie of the Year Kyrie Irving and first-round draft picks Dion Waiters and Tyler Zeller on the Cleveland Cavaliers Summer League team, which begins play Sunday in Las Vegas. Campbell, a 5-foot-9 second-year pro out of the University of Portland, became one of the Charge’s success stories in their inaugural NBA Development League season. A fourth-round pick in November’s D-League Draft, Campbell averaged 12.6 points and 5.2 assists in the regular season. He was the only Charge player to appear in all 50 regular season games and six playoff contests. After veteran Keith McLeod was traded midway through the season, Campbell became the full-time starting point guard and flourished. He averaged 16.0 points and 6.8 assists over the final 26 regular season games as he carried a heavy load in terms of ball-handling duties and minutes played. Also on the summer league team is forward Luke Harangody, who averaged 19.4 points and 12.6 rebounds in 16 regular season games with the Charge while on assignment from the Cavaliers. Harangody is on a D-League team? Sorry, that's the other thing I took away from that article. Good luck to TJ down in Vegas. Woodless! wrote: Harangody is on a D-League team? Harangody was sent down briefly during the season. I'm still a little surprised TJ didn't even get a 10 day contract during the season, especially when Kyrie was hurt. He got significant playing time in the D-League though so hopefully someone notices him in the summer league and gives him a shot. 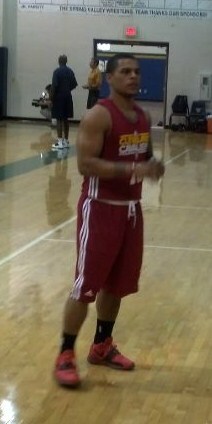 Rob Jones out of Saint Mary's is also playing on the Cavs team. I have never cared much for the Cleveland Cavaliers uniform, but TJ makes it look about as good as possible. D-League play starts Sunday ... we're rooting for you TJ!! Bad break for the #1 overall pick in 2011 and NBA Rookie of the Year, Kyrie Irving who injured his hand yesterday while slapping the padding on a wall at Cleveland Cavaliers practice in Las Vegas. A good break for TJ? One can only hope so! So far TJ is averaging 6.0 points in 14.7 minutes through the first three games. He's hit 4 of 5 three-pointers! In yesterday's game, TJ got some good minutes, but in the first half he barely touched the ball. It's obvious to me there is no room on the "varsity" for TJ with the likes of Kyrie Irving, Dion Waiters, and Donald Sloan all at guard. They are taller, athletic, and scorers. TJ was 0/2 from inside the arc; 2/2 outside; and 1/1 at the stripe. Unbelievable finish! After a couple of minutes of the refs looking at the replays, TJ Campbell's last split-second heroic shot from under the basket wins the EuroChallenge Final for his French team, Nanterre. Heroics aside, no rebound by the beloved TJ there. Nor am I worried about errors. As I have indicated before, thank you for all the great info. Keep at it. TJ’s wonderful shot as close to the buzzer as any beater can be.